Jordan Greenway’s second-period goal gave the USA a 2-0 lead in its first opening round game, but Slovenia rallied to tie the score late in the third period and won in overtime, 3-2. Greenway, who centered Team USA’s top line, had four shots for the game. Matt Gilroy, serving as an assistant captain, had a team-best 26:26 on the U.S. blueline. Next up for Team USA is a match-up with Slovakia that begins at 10:10 p.m. ET today. Canada, captained by Marie-Philip Poulin and with Jenn Wakefield on the roster, edged the USA, 2-1, in a preliminary round game between the two tournament favorites. Terriers dropped a heartbreaker in the Beanpot Championship game on Tuesday, losing to #3 BC in overtime, 4-3. BU had overcome a 2-0 first period deficit and held a 3-2 lead late in the third on goals by seniors Victoria Bach and Rebecca Leslie and junior Reagan Rust. But with just over four minutes left in regulation, the Eagles Darryl Watts, the nation’s leading goal scorer, tied the score with her second tally of the night. The teams would play nearly 15 minutes of overtime before Toni Ann Miano would pot the game-winner on a power play. Bach’s goal early in the second, assisted by Rust, was her 35th of the season and the program record-extending 100th of her BU career. Less than a minute later, Rust made the score 2-2 with her fifth goal, assisted by Abbey Stanley and Nara Elia. 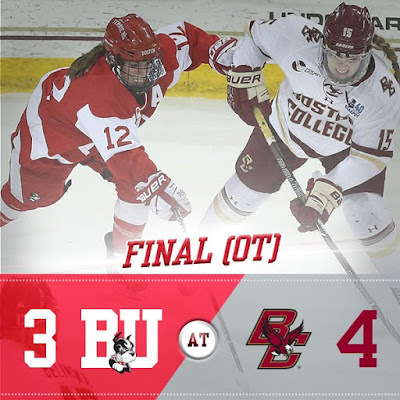 Then Leslie (19th) gave BU the lead with assists from Bach and Breanna Scarpaci. Freshman goalie Corinne Schroeder stopped 30 Eagle shots. In the Five Nations Tournament in Plymouth, Michigan, Team USA has a 1-1 record after three games. 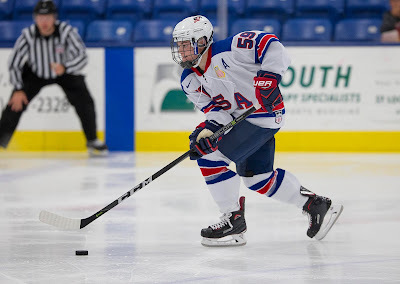 In Team USA’s 5-1 win against Sweden, 2018 recruit Jake Wise assisted on a pair of goals while Joel Farabee and Tyler Weiss each contributed a helper. Yesterday, the U.S. dropped a 6-2 decision to the Czech Republic. Farabee’s first period goal had tied the score at 1-1 and Jack DeBoer’s shot was redirected home by Erik Middendorf in the second to cut the lead to 3-2. Team USA will play Russia on Friday and Finland on Saturday. 2019 recruit Trevor Zegras scored the game-winning goal and added two assists in a 5-4 NTDP U17s win over Russia in the Five Nations Tournament in Finland. Case McCarthy and Alex Vlasic each had an assist for Team USA, which next plays Sweden on Friday.